Three decades ago many thought the world of steel would stagnate. New production technologies—basic oxygen furnaces, continuous casting, continuous annealing lines and development of higher strength steels—already were in place. Some even considered steel a commodity. Fig. 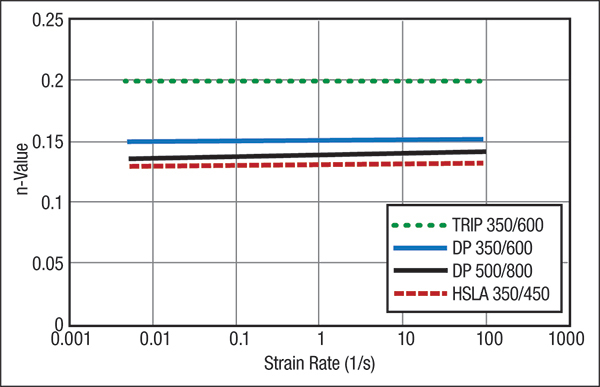 1—Curve showing small increase in yield strength with major change in strain rate. Press speed is approximately a strain rate of 10/sec. Source: AHSS Application Guidelines–V 4, June 2008 (www.worldautosteel.org). of advanced high-strength steels (AHSS), sometimes called designer steels. These steels went beyond the needs of formability to address corrosion protection, crash-energy absorption, the strength needed to protect passengers trapped inside a flipped vehicle and weight reduction for improved fuel efficiency. This research continues today to meet new demands generated by the public or mandated by the government. While most action has been in the automotive industry, the technology and its advantages filter down to other industries—the appliance industry, for example. Each year, the Society of Automotive Engineers holds an annual International Congress in Detroit, and each year the manager of materials research for a major appliance company would attend. After observing him taking notes year after year, an automotive engineer finally asked why he was so interested in automotive technology. He replied that the materials he was learning about most likely would enter the appliance industry within 5 yr., and he sought to give his company a head start. Being associated with the application and formability of steel is an exciting field. While one is required to study and understand all of the new technology, being part of the advancement is fully rewarding. Creating a virtual 3D die and then conducting die tryout in the virtual world not only is beneficial for your company, but personally satisfying as well. Fig. 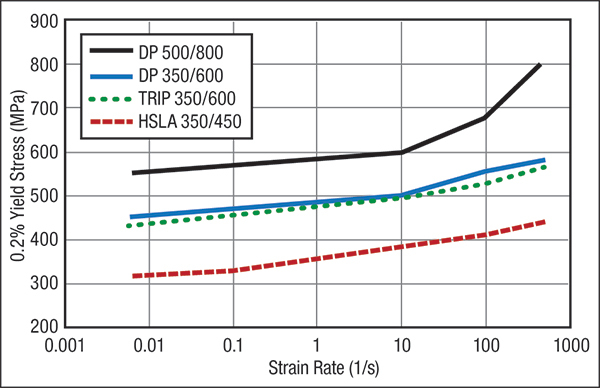 2—Steels with YS greater than 300 MPa have almost constant n-value over full strain-rate range increase of 104. Source: AHSS Application Guidelines—V 4, June 2008 (www.worldautosteel.org). Or, we can establish a new culture in your press shop where personnel receive up-to-date training in both the “how” to do things and the “why” you do them. For example, ordering steel with increased yield and tensile strength reduces stretchability (n-value) and bendability (total elongation) of most sheetmetal. When the material forms to the required shape, the stresses further increase and residual formability decreases. While this occurs when forming all higher strength steels, for some of the AHSS grades, the strength already is very high and the formability limited. Some press shops mix science with press-shop war stories. As such, their rules state that these very high-strength steels must be completely formed in the first hit and cannot be reformed because the steel becomes too hard and brittle. While work hardening does increase the hardness of the cold-worked steels, the change in formability parameters does not correlate with any increase in hardness. Since then, good correlation between formability and hardness has not been achieved. Actually, the term “work hardening” should be changed to “work strengthening.” We have learned that the hardness test correlates well with the resistance of sheetmetal surfaces to wear and scoring. Being required to complete all forming in the first hit is a good suggestion, but not because the steel becomes brittle and fails. Steel work hardens so much that the areas formed in the first hit are very much stronger than the rest of the stamping. If the deformation in these areas falls below the forming-limit curve, the material’s residual formability can be used. However, attempting to create any additional forming most likely will cause other areas of the stamping, with less deformation and less strength, to react to the increased forces—not the desired area. Finally, when failure initiates, the fracture mode is not brittle but the usual ductile cup-and-cone. Another example of outdated press-shop practices: Some shops still obey a maximum press linear-velocity table published in 1939 by E.V. Crane. His table shows a maximum ram velocity for steel of 50 ft./min. for single action, and 35 to 50 ft./min. for double action. Presses run at much higher speeds, yet the same data has been republished in die handbooks for decades. Going back to the initial study, the onset of galling (a lubrication problem) established the limiting press speed, back when lubrication was 15-percent lard oil and 5-percent wool fat in a mineral-oil base.